Honor their voices by standing up for themselves and what they believe in.Have a strong sense of identity. Focus on their unique strengths and talents. Recognize the power they have to impact their communities in a positive way. Know the joy that comes from true friendship and real teamwork. Girls on the Run educates and inspires 3 rd through 8 th grade girls to stay true to themselves and develop essential life skills. The program uses hands-on learning through the power of running, to prepare girls for a lifetime of self-respect and healthy living. The lessons creatively incorporate training for a 5k which to girls take part in at the end of the 10 week program. Crossing the finish line is a defining moment when girls realize that the seemingly impossible, IS possible. 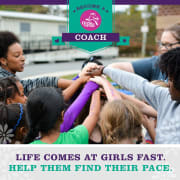 Girls on the Run coaches do not have to be runners themselves; you just need to be willing to guide and mentor girls through a fun and uplifting program. Over the course of 10-weeks, you will meet twice a week for 75 to 90 minutes with girls in 3rd through 5th grade (Girls on the Run) or girls in 6th through 8th grade (Heart and Sole). Everything you need-supplies, snacks, curriculum, & handouts-is provided for you in your coaching tote.